The new sanctuary at Monmouth Worship Center, outfitted with a new state-of-the-art sound and lighting system with the help of Guitar Center Professional. WESTLAKE VILLAGE, CA, February 28, 2011 — Guitar Center Professional (GC Pro), the outside sales division of Guitar Center that focuses on the needs of professional users, recently helped outfit the new location of Marlboro, New Jersey-based Monmouth Worship Center with a new state-of-the-art sound and lighting system. GC Pro and Monmouth already had a working partnership at the church’s previous location. 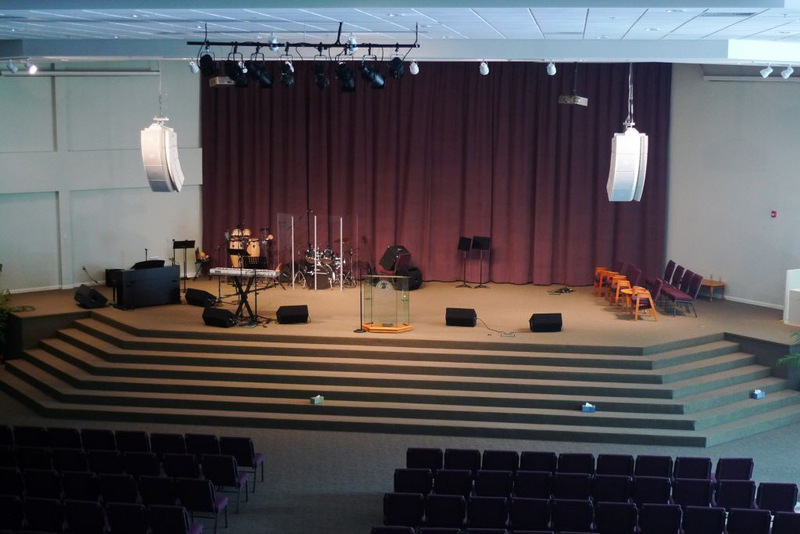 When the decision was made to build a new church from the ground up, Monmouth Pastor Joe Hewes knew they would need impressive lighting and sound to match the new sanctuary, and they ended up turning to GC Pro, not merely for the gear itself, but also for design, installation and commissioning of their facility. The new gear list included eight JBL VRX932LAWH line array enclosures and two JBL SRX728S subs; an SC64 64 I/O Digital Matrix Processor, two SC A-8IN SC32/64 Analog Input Cards, three SC A-8OUT Analog Output Cards, three ZC1 Wall Mount Zone Controls and a ZC3 Wall Mount Zone Control, all from dbx; three Crown XTi 6000 Power Amps and two XTi1000 Power Amps; various power products from Mid Atlantic; a 64-channel snake from CBI; two EIKI LC-XL200 6000-Lumens Projectors; and a full complement of lighting products from Altman and Elation. GC Pro was also able to provide Monmouth with new Shure Wireless microphones and transmitters, in compliance with the 700 MHz changeover. 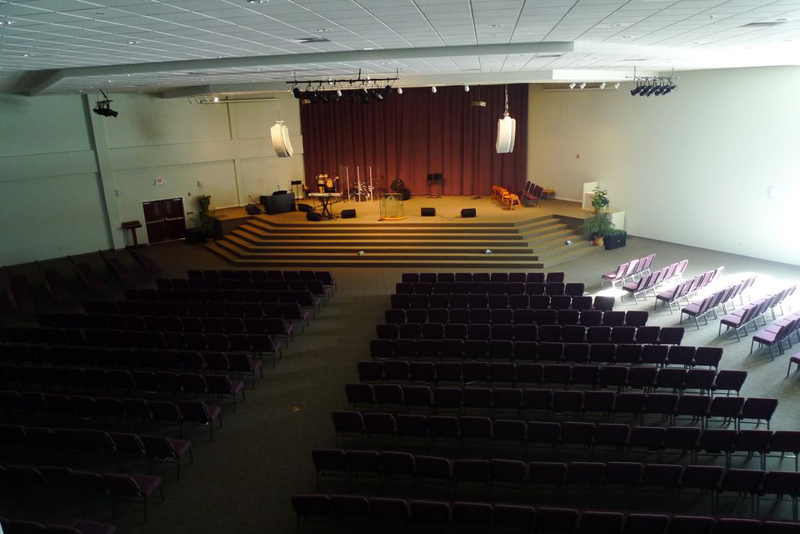 A “second-phase” installation is also planned for the near future, with an upgrade to the church’s console, a center speaker cluster, more wireless systems, acoustic treatment and a more massive lighting system. “They are even considering a recording studio, which of course I would be thrilled to be a part of,” adds Rivera. Photo Caption 1: The new sanctuary at Monmouth Worship Center, outfitted with a new state-of-the-art sound and lighting system with the help of Guitar Center Professional.